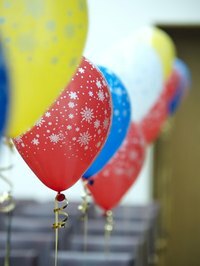 Helium (He) refers to a common chemical element that usually exists as a gas. Helium represents the second most common element in the universe, after hydrogen. Helium gas is used to fill balloons, fire rockets, and float blimps, and also has applications in arc welding, nuclear reactors, and wind tunnels. Handle helium with care, since it can be dangerous. Store helium tanks in a cool, dry, ventilated area, labeled for compressed-gas storage. Keep tanks secured upright and label them clearly. Keep flames and electrical devices away from stored helium tanks. Keep helium tanks secured in the trunk of your car, if possible. If you cannot keep the tank in the trunk, secure it and keep your windows open. Never drag or roll a helium tank. Use helium tanks in a well-ventilated area away from sparks, fire or electricity. Secure helium tanks before use. Do not let children operate helium-tank equipment, and never leave helium tanks unattended. Close, label, and return empty helium tanks. Never inhale helium from a helium tank or filled balloon. Inhaling helium can cause lung damage, suffocation, and death. What Are the Differences in TIG, MIG & ARC Welding?